When Americans ski they should be prepared to experience discomfort for at least a portion of the day. While freezing temperatures, high winds and cracked goggles may contribute to this vexation, the largest travesty while skiing is usually in the ski lodge. Let us examine the sub-par cafeteria at a typical ski lodge. You walk through the swinging double doors and meet an unruly crowd. Throughout the day your boots have slowly squeezed your toes into numb oblivion (the result of your insistence to increasingly tighten your boots for more Lindsey Vonn-like speed and control), so you loosen the buckles, letting them flop to the side as you scope out which packed table you can finagle yourself into. Rogue helmets, gloves and goggles continuously wander their way into your trayful of overpriced, under-seasoned food. Grease from your cheeseburger stains your fleece vest. Your ski-bum buddy grosses you out by mixing his frugal concoction of tomato soup (ketchup and hot water swirled together; stolen saltine crackers dunked into the muddy liquid). 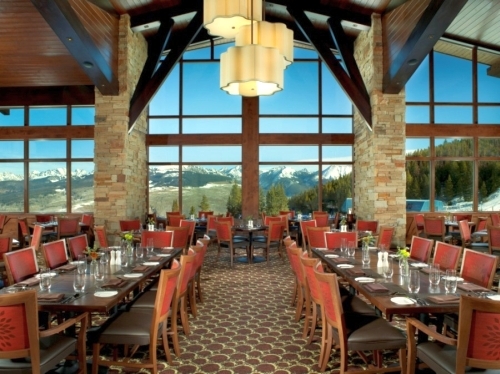 Disgruntled skier, meet the 10th Restaurant at Vail Resort, Colorado — the new ski-in, ski-out restaurant located at mid-Vail mountain. It’s namesake pays homage to the 10th Mountain Division, the 1943-established group of the gnarliest soldiers ever: High-altitude skiing, hiking and climbing were their specialties. In Colorado, the logo of crosshatched skies signifies bravery, living in cahoots with nature and all around badassness. 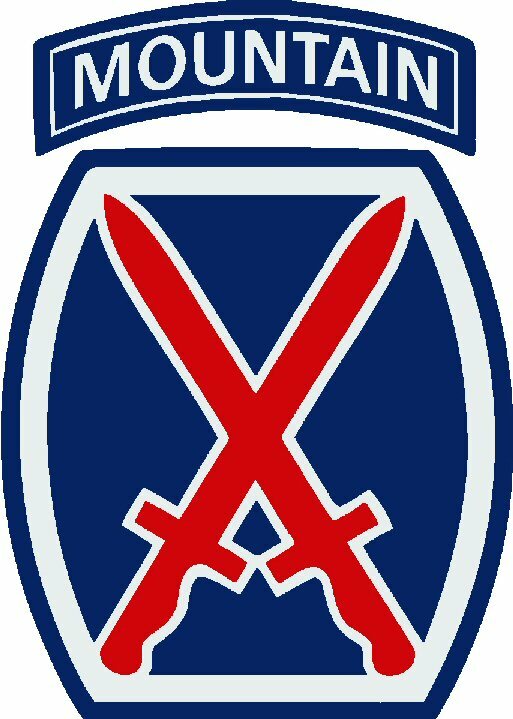 I have the utmost privilege (not to mention bragging rights) of being a descendent of the 10th Mountain Division (my grandfather was a ski instructor at the training grounds in Camp Hale, Colorado). While the music playing in the ritzy bathroom of the 10th restaurant — “That’s The Way I Like It” by KC and The Sunshine Band — didn’t exactly channel my grandfather’s courageous spirit, the quiet beauty and sophisticated rustic interior of the structure sure did. A commendable aspect of the restaurant is the locker room, where tired and cold powderhounds can discharge their wet gear, unbuckle their boots and relax into the cushy comfort of complimentary slippers — real slippers lined with faux fur. In one fell swoop you relax into the Western opulence of the 10th. 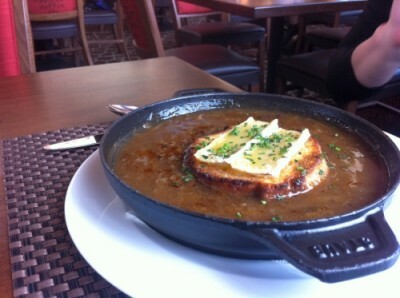 Start your meal with the Caramelized Onion, Porcini Mushrooms, Caraway, Brie and Brioche Soup. This steaming bowl has a rich and earthy quality to it that when topped with slices of brie, toast, and fresh herbs, the dark and fragrant broth succeeds in warming up frigid and stiff bones. Pluck a roll from the your tasty bread basket and smear heavily-salted butter onto the bread; dunk into the soup. Eat. Repeat. 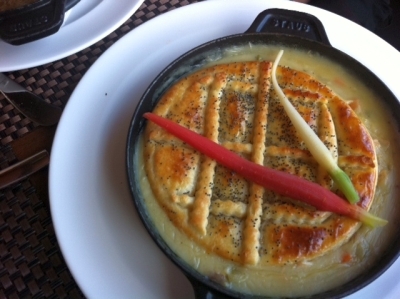 If you’re feeling famished, the Heritage Chicken & Pheasant Pot Pie with Heirloom Root Vegetables & Vermouth Cream is a point of pride for the restaurant. Served in a cast iron skillet, this beauty is topped with a golden crust reminiscent of your grandmama’s heirloom quilt. This meshes with the hot velvety stew laying underneath — like freshly-tuned skis on a powder morning. But eater be warned, this piping hot skillet-full is large enough to feed more than two frozen ski bunnies. Myself and my sister — who happens to work for a ski company (and the answer is yes, I do get free gear) — were stuffed out of commission after just a few bites. This classic dish fills the soul, and perhaps your arteries, to the brim. Unless your bank account looks like P. Diddy’s, the 10th Restaurant is not an everyday indulgence. If you are trying to beat the amount of vertical feet you ski in one day, lunch is far too leisurely for that. And despite the notorious prices in cafeterias, the 10th’s bill can add up even more rapidly. But it is a place for special occasions. Where you can take a break from the chaos and crunchiness of the typical ski-day and morph your dirt-bag, bedraggled self into a citizen of true refinement. Just like Mr. Combs himself.